Anti-climactic irony – Copenhagen Climate Conference finale hit with snow and cold | Watts Up With That? Dec. 17 (Bloomberg) — World leaders flying into Copenhagen today to discuss a solution to global warming will first face freezing weather as a blizzard dumped 10 centimeters (4 inches) of snow on the Danish capital overnight. While I’ve never put much faith in his forecasts due to the overhyped way he presents them, in this case Piers Corbyn was right. See his November 30th forecast for Copenhagen here. And now, send in the trolls. December 17, 2009 in Copenhagen Climate Conference, Fun_stuff. Too bad Gore didn’t show up, a true blizzard might have developed. Funny and don’t need a translation here. Ah, but it’s rotten snow! Why are these ‘caring,sharing’ Socialists always so ANGRY!? Now, maybe we can find enough Christmas carolers to drown out the protestors. Here is the hour for hour forecast for CPH http://www.yr.no/place/Denmark/Capital/Copenhagen/hour_by_hour.html ) -3 and snow for friday!) Nature is sending a unambigous message. Piers Corbyn has an interesting story to tell. And his forecasts are often quite accurate. Although given our budgetary crisis, I wouldn’t be surprised to see the incoming Govt slash the Met Office’s budget and give Weather Action some business…..
Those aren’t snowmen! Those are the protestors we were reading about earlier in the conference. They represent Greenpeace and numerous other caring organizations. And they expect reporters on expense accounts to leap out of snuggling with the prostitutes and stand in line 5 hours to ask a question and get kicked out for asking a question on camera? Ask Freud…..it’s really hot in them.Burning libido firing climate change! As far as I know, Piers Corbyn spells his name with y. Thank you for posting the Bloomberg article. Caretakers of climate stations omitted from HADCRUT gather at UEA to demand representation. It’s the Christmas season and I’m just going to luxuriate in this comment section. Ahhhh . . . .
God bless us – everyone! Leader: He who leads others. Do these? Socialists are angry because that care about the poor only half as much as they hate the rich. Sorry this is slightly OT but, here’s an opportunity for those more credentialed than I am to “school” a “former managing editor and professor emeritus at the Missouri School of Journalism.” Have Fun! I told you there was going to be a blizzard last week. Who needs weather forecasts when you are a psychic? Call 1-800-EDSEL-4-U for your personal consultation. Greetings from Cool and sunny Santa Cruz. Not to be particulately critical but I see a lot of SOOT on those protesters. Are they from China? Well, one good thing about the snow is that it should cool the ardour of anyone wanting to wreck Copenhagen (the city) when their unrealistic goals for the event aren’t realised. Next year could be very different, however. It is being held in Mexico city during an El Nino year, when higher natural temps could easily be massaged upwards by a couple of tenths to show the highest ever temperatures. Then we’ll see the warm-mongers coming back with a vengeance. No doubt they’ll turn off the air conditioning for extra added effect. This isn’t over by a long shot unless something else comes about to blow this AGW meme out of the water. Yes, God’s sense of humor: He waited for the leaders to be in transit before the blizzard hit! You know, I’ve wondered about that myself. All the way from Stalin to He Who Shall Not Be Named from the German National State Socialist Party and on to the modern neo-socialists: They are all terribly distraught and angry about things. BTW, if would be nice to have Dutch Canal skating on the “Weather is not Climate” watch list. I’m hoping for some great pictures of Dutch canal skates in, oh, February or so. Wonderful…simply wonderful…The gore-effect is in full swing…. The only thing wrong with the report is to call it a “blizzard”. I guess…to some of the internationals from warmer climes who never see snow…it was. Regardless, perfect timing! The Gore Effect in action once again. I live in Sussex, SE England – we’re forecast 8-10 inches of snow tonight. Since I live 3 miles from the English Channel/at sea level and haven’t seen anything other than a sprinkle since I’ve lived here – this a bizarre. We had the first serious cold snap last year when it dropped to -7 to -10 for many days. It normally never falls below zero or at worst -2/-3C. It was so bad that I dug up a tree fern in my garden in the dead of night and it stayed in my downstairs bathroom for a month. It’s also become noticeably less windy in the last 5 yrs – it was like living in a lighthouse during the equinoxes – now it is a rarity to experience days of gales. Whatever is going on – its fairly recent and weird. It’s snowing…in Denmark…in December. Why are you posting this exactly? Just makes skeptics look stupid. Gore WAS there. I’m pretty sure – there was a vid showing how goons muscled him through without an interview. Yes, in my spare time from doing physics I am also a witch, and I had ordered a blizzard for the leaders :). Witching is appropriate for the global warming circus, they all think like Harry Potter and create realities in their computers believing they are executed in the real world. In other words, the gods pay back for hubris. Let us hope they do not give us a little ice age. The entire program is pure warmist propaganda and contains nothing but bias, half-truths, fudge and outrageous lies. I am actually legally obliged to fund this poisonous bilge. Apologies if this has already been brought up on another thread. Oh and did anyone mention that the Met Office’s winter forecast has been rubbished by Mama Nature in record time? paulhan (10:57:52) : I guess there won’t be any more jamborees of this kind for these peoples, their masters have just found them misfitted, not suited to job. They have totally failed, they will be replaced. As of now that is. Intellicast says snow showers for Fri Sat and Sunday. Is the the BBC who are deniers?? and then wonder why they went in with their jackets buttoned up but came out unbuttoned! Eh? What color Edsel would you like? The lot is full. Take your pick. And there will ALWAYS be more on order. Oh, and when eating polar bear: ALWAYS cook the meat, trichinosis is a big problem in bear meat and eating raw polar bear can be lethal. Also, if you eat the liver it has very high levels of vitamin D: Enough to kill you! So don’t eat it unless you have a major vit D deficit and then only small amounts. But IIRC, the adrenal glands on the kidneys will give you vit C in an environment where it is otherwise a very rare thing. Split it equally between all party members to avoid scurvy. Funny, according to NASA, El Niño picked up pace this summer already, this year is also El Niño year. But of course this concerns the Atlantic Ocean for this year, next year they’ll just delete everything. I am actually legally obliged to fund this poisonous bilge. The polar bears can now move to Copenhagen, since all the polar ice has melted. The ultimate test of The Gore Effect. Hey, they can now conclude the conference on a successful note, having defeated global warming. It’s a BS vs White Stuff spitting contest. The snow is calling thier bluff. Don’t forget that one of the computer runs showed that if we successfully addressed all the supply, social, and environmental problems we would run out of capital. Have you been keeping up with the financial pages? There’s something very funny about the little snow men. It’s the expressions. I’d like to know if the polar bear and other sculptures have melted yet. I’d like to see the bones they put inside that polar bear sclupture. Just as Piers Corbyn forecast weeks ago! You just KNOW that kids are going to be brainwashed to start making ‘snowbears’,don’t you! It’s usually that they had this dream that everyone would be as caring and sharing as they think they are. But they’re not, so they get ANGRY. Thing is, they’re not always so caring and sharing themselves as you think. Status is real important for socialists, you know. Title and position, seniority and rank. All that stuff. They’ve got to LOOK AFTER THOSE UNFORTUNATES you see. Thing is, THOSE UNFORTUNATES also includes anyone who disagrees with them who they can crush. Once they’ve crushed you, the caring, sharing stuff comes back. But when you try to be independent or confront them, hell hath no fury like a socialist scorned. Wire tapping, accessing bank account details, destroying all activities, they’ll do it. Control you see. It’s in their DNA. But they need a mask of respectability to allow society to allow them to get it. So they call themselves a socialist. Not all socialists are like that. Ken (11:04:17) : It’s snowing…in Denmark…in December. Why are you posting this exactly? Well, my guess is because, as the Masthead says, this site is dedicated to “nature, science, weather, climate change” and notice that weather comes ahead of ‘climate change’ on that list. So a site dedicated to weather does a story about weather when the weather is a very funny thing due to the impact on the AGW folks who seemingly can’t figure out it’s cold even when they have to stand in the snow. That, dear Sirah, is a “hoot and a half”! Just makes skeptics look stupid. Something I would agree with completely. The sheer irony of folks chanting about doom from heat when frozen in the snow is priceless. Giving me chuckles all day long. They either “believed their own BS” and expected it to be warmer than in the past; or they didn’t think through what they were planning by checking out the weather ranges. Either one is just a thigh slapper… They ought to have booked it for Dawin … or Jakarta … or even Brasilia. DC expecting a major snowstorm in coming days. Wonder if Obama will be able to fly out to the conference or be delayed because of the snow storm? Irony is a …..
Channel 4 news correspondent at Cop15 stated” despite the recent snow this year has been the warmest on record”. Correspondents name is Peter Snow ( i kid you not!) is there any data to support his claim? Denmark relies on wind turbines for it’s major power supplies. They have to import power from Germany when calm weather sets in and give it away free to Sweden when they have an excess due to strong winds. How do those wind turbines hold up operationally in snow and ice conditions, just when they need the maximum power output for heating and industry? A blackout in Copenhagen would really set the seal on this whole farce. snif, are we seeing the last of the Snowmen? Already having been reduced to a race of impotent midgets, are we content that soon another extinct species shall be remembered only in cynical proxy by the hoisting of “Frosties” by drunken Deniers responsible for the ineluctable destruction of Creation? Proof positive that this is not about climate, at all. Vitamin D and polar bear livers: I had heard this as well (although I believe Vilhjalmur Stefansson (early 20th C polar explorer/anthropologist) wrote that the inuit could eat them in moderation. There is a related story that if polar explorers, driven to extremes killed their sled dogs and ate them, if they ate the livers it was fatal. (This was used in the inspiration for a UK TV police story – fictional, but I think the inspiration was factual). This is because they would be eating the liver of a carnivore. The vitamin D in a carnivore liver would be far too concentrated to eat safely, as it tends to accumulate in the liver. The cows, sheep, pigs and chickens whose livers humans would normally eat (if at all) are of course not carnivores, so this is not a problem. (I have forgotten some of the biological detail here, but that’s the gist). Remember kids, don’t eat your puppy’s liver what ever you do. See how the cold creeps down from Sweden. Even colder on Saturday. Sweet, sweet schadenfreude. I hope the airport is snowed in at the end of the conference. Oh good, a “weather is not climate” post to muscle in on. Here in New Hampshire, I was a bit startled to see it was 5.6°F (-15°C) this morning with gusty winds. Either measurement is no surprise, but for a temperature that cold in December, we generally need calm air and radiational cooling. Well, there’s always radiational cooling on clear nights, but on calm, clear nights we get a thin air inversion with the cold temps near the ground. So I looked back in my records since 2003 for mornings below 10F and wind gusts over 10 mph (16 kph, 11.5 knots?) and found one other occurence – in 2008 on Dec 8th. Three days later it was 58F (15C) and a few days after that we had one of the worst ice storms in southern NH and north central MA history. Some coworkers had no power for 10-14 days. Murphy’s Law just making a visit to the summit. We all know Murphy. This time he is welcome. @ Michael Where did they get that tripe about the GHG and the cooling upper atmosphere? 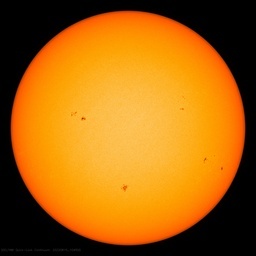 The suns radiation in the UV is down 6% of recent. Hence the stratospheric cooling. Oh yeah – The Irony! Now the New Left declares their interest only in minorities of any kind, illegal immigrants and Mother Gaia. Their original poor and working-class electorate can go to hell together with the rich. How many “Nobel Prize” winners are at this meeting? I would be surprised if it doesn’t turn into the “Storm of the Century”. and still, if I’ve mentioned it before…my neighbour’s name is…Blizzard…IKYN!! I guess you can get my address via that info…! Here’s what we have to put up with in Canada. Talk about a leap in logic. Putzuski thinks GW is the same issue as slavery. What an idiot! Yes, it’s just weather not climate obviously, but it proves is that God has a sense of humour…. it’s rare any politician from right or left speaks about climategate and, when they do, as below, only politico blog reports it. nice. In a letter to Obama, Reps. Jerry Lewis, the top Republican on the house Appropriations Committee, and Mike Simpson, ranking member of the interior and Environment subcommittee, say that funding in the 2010 budget should be used to investigate whether “illegitimate scientific evidence and research” was used to craft Democratic climate legislation. when u remember rightwing governments in copenhagen are at least as pro-AGW as so-called leftist ones, u should realise it’s not a party thing. the accusation out of russia yesterday was barely reported in the MSM. a couple of newspapers in the UK and that was it. and that included a blog on UK telegraph, will heaven, mocking the accusations. climategate has given us explosive lead headlines almost every day, yet the MSM has virtually ignored it, or attempted to downplay/discredit what it has revealed. The funny thing about all of this is, if it were a conference on combating global cooling, they would have signed the all of the necessary agreements in 2 days. Done. Yup, first snow of the year here today, a cold ride home on the old Matchless from work to my home 10 miles away. Its staying on the ground now too. I do hope Seth Borenstein has to queue again for seven hours in the snow before he gets the chance to genuflect before his Obamaness. Those snowpeople look pretty angry. Just a quickie – I posted the first part of the Monckton video – the other bits are much more entertaining/useful. Well worth a watch – one hour in total. They are all terribly distraught and angry about things. As Heinlein put it, Hell hath no fury like a pacifist. An interesting letter was printed in the Daily Telegraph this morning. SIR – Douglas McCormack (Letters, December 14) says that global warming isn’t responsible for making the Carteret Islands in the South Paciﬁc uninhabitable. Mr McCormack justiﬁed his argument by referring to my 2007 paper on decadal variability in the rate of average global sea level change. While I don’t dispute the rates of change that are quoted, I disagree that my results either prove or disprove the idea that human-induced global warming is responsible for the sea-level rise that is displacing the inhabitants of the islands. Moreover, it is not logical to say that because the paper found no evidence of an acceleration in global sea level that the most likely reason for the ﬂooding of the islands is due to plate tectonics. The point of the journal article was to show that global changes in sea level do not proceed smoothly and that there are periods of higher rates of increase along with periods of lower, or even occasional negative change. The paper also shows that the global average sea level has been rising for more than a century, and continues to rise. Sea levels that coastal dwellers experience are affected by local land movements. These movements include the recovery of the Earth’s surface from the deforming weight of ice sheets during the last Ice Age, subsidence due to water extraction, earthquakes and regional plate tectonics. These effects are carefully taken into account when we calculate the global and regional sea-level changes, but these effects may add or subtract from the relative sea level experienced at the coast. As far as I am aware, there is no evidence for or against local land movements in the Carteret Islands. So while this effect cannot be discounted as making the islanders’ problems worse, local land movements can only be seen as a regional modiﬁcation of the rise in global sea level. The last paragraph in this story seems to be inspired by Michael Mann, except that one would have to substitute “hide the decline” instead of “explain” in Michael’s case. Seven metres. That is how much global water levels will rise if the ice in Greenland melts. In connection with the climate meeting, sculptor Jens Galschioet has hung flashing red lights seven metres up in trees and on lamp posts throughout Copenhagen. The idea was to illustrate a prospective water level rise if the ice melts away in Greenland. Yet, somewhere along the line, he made a few incorrect calculations. ‘Technically and pedagogically it is a sound idea. The problem is that they are hanging at incorrect heights by the city lakes, where they currently sit at 11,34 metres’, said architect Ole Oerslev. The city lakes are already 5,89 metres above sea level, so the flashing lights should have been put up at 69 centimetres height. ‘The rest of the lights put up around the city and out by the Bella Center are in the correct elevation. We wanted to display something downtown as well and even though we knew that the lights should have been at 69 centimetres, we didn’t really feel it looked like much. So we cheated a bit and decided to explain if anyone found out’, explained Galschioet. It is cold here in Britain, I wasn’t going to comment but I saw this below on the Tom Nelson blog, these loonies are everywhere. Somebody should explain to these kooks that cold is the real killer. Britain is poorly prepared for a real chill……. we all should embrace natural warming, is this cold weather in Denmark a harbinger of things to come especially now the Met Office has forecast a mild and wet winter? Crowded at the trough? Oink, oink! I take it that you have an ample supply of translucent hollow fur to make whizz bang steelhead flies out of. Don’t tell me they eat the fur too. When it comes to bears of the polar persuasion; I believe in getting them before they get me. As it seems to be a bit dodgy to eat polar bear bits, does anybody know of any safety issues regarding the consumption of penguins? I was going to go with the teeth and claws as being the killer. I’m a convinced skeptic but suddenly I’m worried. If we let the climate get any hotter all those cute snowmen will die! Frostbite may have been a better teacher for the reporters locked outside than anyone they might have heard inside. Not only do you lack a sense of humor, but you are geogrphically challenged. Copenhagen is on a spit of land basically sitting in the middle of the Baltic Sea. Hence, Copenhagen has a maritime climate, it is not a frigid climate, especially in December. December average high is about 39F (3C) average low about 32F (0C). Very similar to Glasgow, a little cooler than Seattle. Skeptics can read a map, how about you giving it a try? oh dear! australia’s ex-PM john howard on neil cavuto immediately says what we need to do to battle global warming is to go nuclear. cavuto tries to get him to consider it’s all a hoax, but howard says sceptics can’t argue we should go nuclear. i’m about to puke. Not to change the subject too much, but what’s the latest from data analysis of temperatures from South America and Africa? I hear grumblings that those datasets have been fudged too! Environmentalists are nearly always *against* things, and it doesn’t take much to morph from dislike or disapproval to anger, especially if you’ve convinced yourself that nearly everyone else is ignorant and selfish. I’ve found that people who are working *for* something are usually more fun to be around. I wouldn’t be surprised if someone’s done a study on this, somewhere. If CNN, NBC, ABC, CBS , or MSNBC covers Climategate, will anybody notice? Here is a story (in Norwegian) about some alarmists who made a 500kg polar bear from a block of ice on Svalbard, and took it to Copenhagen to let it melt during the COP15 conference, apparently to make some kind of point. “The polar bear has long been the symbol of climate change and global warming. This made the choice easy for artist Olav Storø, who made the ice sculpture. The hope is that the bear from the north in a silent way shall speak the cause of the climate to important people. I have not seen pictures of it in Copenhagen, but I guess the bear must be doing just fine, considering the weather there. Gore Effect with an Obama bonus! Please provide an authoritative citation. Are you citing to capacity? or actual generation usage? Denmark is at 20%+ wind capacity, but because the wind doesn’t blow all of the time, wind generation utilization is a fraction of total capacity (25%?). Denmark therefore is an importer of excess Swedish nuke generated electricity to meet peak demand. I’m waiting for the lipstick to come out so they can apply it this pig of a conference—wait for the “Eureka” announcement that they all agree to meet later… sometime… somewhere… promise. And we’ll bring some money if the Chinese do. Thanks WUWT, this post has made my day. It gives me a lovely warm glow to see that the CAGW fools are being shown by our climate who is the real Daddy. To complete my unexpected Christmas present, I’d like the airport to be closed and a large solar CME erupt and take out all the power. Perhaps there really is a Santa Claus? As someone on another thread said, “it’s too big to fail.” Too many have their paws in this enormous honey pot to let a little snow flurry interfere with their agenda. Here Dr. Tim Ball spills the beans on climategate and more (1st of 5, see there for rest). More carbon emissions since they will need to run those limos longer to get them all warm and cozy before our “elected” and “unelected” representatives step out to move around town. They certainly don’t need anything to remind them that it is getting colder and not warmer… that could be inconvenient to sit on cold leather seats. Sorry, should have been more verbose. Go to http://www.energinet.dk , click on the green map of Denmark in the upper right corner, under the text “Elsystemet lige nu”. A Flash popup should come up, showing the current electricity usage, production, import and export. On a sidenote: I am Danish and know all about our import of Swedish (and German) nuke-power. About 30 years ago our politicians agreed that nuclear energy should not be part of Danish electricity policy. So instead we buy it from neighboring countries. The public opinion has changed since, and some surveys show that the Danes are now pro-nuclear. An Arctic expedition was found many years ago, all dead in a tent. Their dogs were dead and gone. The expedition apparently hadn’t been able to move and died there. Speculation was that they had eaten a polar bear uncooked and trichinosis had set in, debilitating them all. They died from trich and/or froze to death. The latest news is that it’s getting even HOTTER than we thought!! 5.4F? It IS worse than we thought! Stephen, I did just that.Looks like you are a net exporter just now. So, those powerplants you have, what are they burning? Interesting link, Stephen. Very well done. Bah, it´s still summer weather down there in the south, up here in the northern part of scandinavia we have a large inversion and around -20c at the moment. Eating under-cooked pork can give you trichinosis, too. It’s a roundworm infection which gives the following symptoms: fever, muscle soreness, pain and swelling around the eyes, thirst, profuse sweating, chills, weakness and tiredness may develop. Chest pain may be experienced since the parasite may become imbedded in the diaphragm (the thin muscle separating the lungs from abdominal organs). So, when roasting a polar bear make sure that the deepest part of the meat has reached over 150F. Should take no more than about 20 hours to do a whole bear. Oh, and don’t try to eat a wolf, they’ll give you the same infection! Yes. The plant at Redcar has been mothballed and production moved to one of Tata’s plants in India. Supposedly to benefit from carbon credits. Christopher Booker had a take on it in the Sunday Telegraph 10 days ago. Goregoons Large male man-bear-pigs capable of wrestling a microphone from anyone asking Al Gore a question he does not want asked. Yep, they went there with high hopes of saving the planet, not realizing they would simply be useful idiots, and part of a huge circus show, and shut out of the main attractions, forced to stand in the freezing cold and snow without access to toilet facilities, food, or water. That can tend to make people a bit cranky. Maybe there will at least be T-shirts saying “I survived Hokumkookenhagen!” they can purchase to console themselves. The original snowmen image seems to be this Flickr photo. The Ice Bear was flown by BA to London instead of Copenhagen, together with rest of luggage of the Norwegian delegation flying to Copenhagen conference ! See it via live webcam from London. And if they are willing to take, you had better be willing to give. May their fate be that of Mr.Creosote. KILIMANJARO – At the foot of Africa’s snow-capped Mount Kilimanjaro, images of the mountain adorn the sides of rusting zinc shacks and beer bottle labels, but the fate of the real version hangs in the balance. As politicians and lobbyists try to thrash out a new climate deal in Copenhagen, experts in Tanzania say local land practices must increasingly take their share of the blame for the rapid shrinkage of the ice on Kilimanjaro’s peak. Well, I just returned from an earfreezing but refreshing two hour walk in the southern part of Denmark, and I can assure you that the blanket of icy white stuff covering the streets looks and feels pretty hale to me. It doesn’t seem like it’s about to melt either. Something is indeed rotten in the constitutional monarchy of Denmark, and it ain’t the snow. The mayor of New Zealand’s capital city, Wellington, reported on the news here today that her contingent at Copenhagen has learn’t nothing new at the conference that will benefit her city, or nothing that Wellington City Council isn’t al ready doing. The $20,000 (N.Z.) costs were paid for by Wellington rate payers and a fund from Local Govt. N.Z. Despite having learnt nothing new mayor Predergast, in true politician style, beileves that the trip was NOT a waste of time and money. As you Americans are want to say, go figure! kwik, we in Sweden import fossil fuel energy from Denmark because most of our nuclear power is down for maintenance. If not, we would be freezing to death as it is cold here, -25.6 degrees Fahrenheit in some parts. Thank God for fossil fuel! Chokenhagen….. it’s all about to come to nothing. Oh well, maybe they can organise another grouphug somewhere else on this planet – the airlines must love the boost to their revenues. And the link below is where I live, about 150km North east of copenhagen in sothern sweden. That is extreemley cold for this time of year. From the Copenhagen Post Online. Temps are set to go to -6 Degrees C with more snow. Hey, Dotto, didnt you vote to close down ALL your nuclear powerplants years ago? I seem to remember that was a “great victory” for …Center party…wasnt it? To illustrate just how the Global Warming is happening (at least in the U.S.), the EIA today announced a near-record natural gas stocks draw down for last week due to the bitter cold over most of the nation. (207 Billion cubic feet last week, exceeded only once before, in Jan 2008). kwik, even the “centerpartiet” have echanged their mind now. They want to build new nuclear reactors to replace the old ones. kwik, even the “centerpartiet” have changed their mind now. They want to build new nuclear reactors to replace the old ones. The icing on the Copenhagen cake for me would be, if when the delegates are leaving for the airport, someone steps in front of Mugabe as he is about to enter his car and tells him that as the conference is now over the travel ban is back in force and he can’t leave. Everytime I get close to a beautiful lady, I begin to breathe faster and exhale increased amounts of CO2. I also get a feeling of increasing warmth, globally, all over my body. That must be simple proof that increasing CO2 causes global warming. I have experienced it personally. That’s all the proof I need. Separating men and women into northern and southern hemispheres should solve this part of the global warming issue. Also the one child per family solution is facilitated. Even better, zero offspring, a probable outcome of this action, will lower the carbon levels even faster. Carbon problem over. I want 5 minutes at the podium in Copenhagen. Send ME a check. If you really want to know what is going on give very heave weight to the statement and don’t dismiss it as an old cliche. You Scratch My Back I’ll Scratch Your Back. Would this be an “Anti-climatic irony” as well? I’d suggest Bill McKibben read up on one or two things regarding CO2. @ genezeien (12:55:49) : Thanks for correcting the Vitamin D blooper. I knew I should have checked before posting and not relied on a faulty memory. That looks like another bear to me… but the same idea. I think they got it right with creative writing. And the profile is high enough. I am wishing on a cosmic particle that Svensmark, from Copenhagen, gets next years Nobel. So, the US is promising $100 billion to “developing” countries for a climate deal! Let’s see, the government of the US of A will have to borrow that money from the Chinese and then give it back to them. This isn’t very smart, if you Yanks don’t mind this Canadian saying. Try the G8/G20 summit in Canada. that is socially responsible, economically sustainable and environmentally just. The East Anglia emails are just the tip of the iceberg. I should know. That I would love to see – however, not holding my breath… – after all, all the delegates are there to “save the world”. I’m an angry socialist because the socialist fools in copenhagen are ruining the “party” and the “country” with their nonsense. Markey, in amongst his glib, unreferenced comments such as “… the glaciers are melting in the Himalayas and the Alps…” [agreed, but some aren’t and the question is why] holds up a large tome titled “Climate Change 2007”. Isn’t it about time reporters and others who are involved in these debates held the proponents to account for their statements at the time they make them? ‘Definitive study’, ‘all of the scientists of the world’, a 2007 document that considered the Climategate emails that were only made public in late 2009. Each of these comments and many others by Markey and other warmists such as Gore, are allowed to be placed into the record and, for those not following closely enough, are remembered as they relate to catastrophic events. Unfortunately, television shows have time limits and need to keep the entertainment value up or they lose viewers, hence investigative questioning is rare. 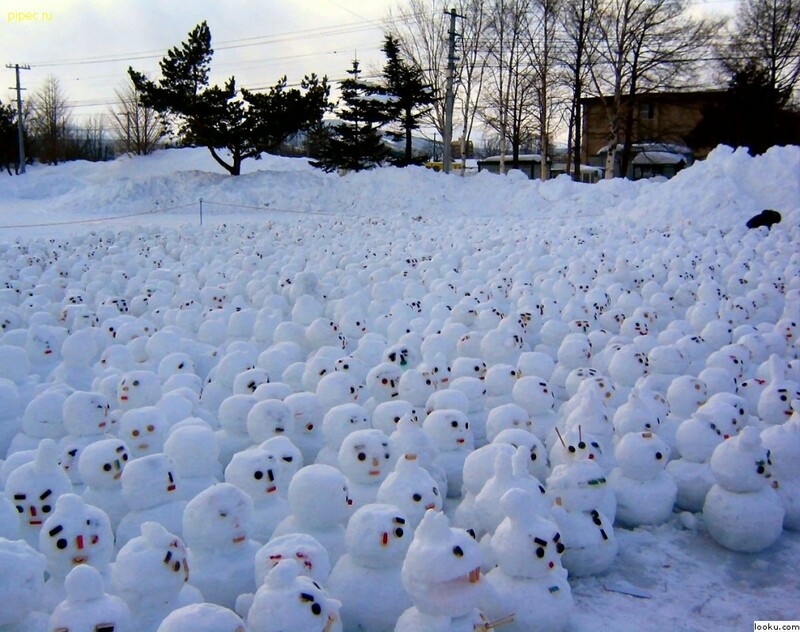 As strange as it sounds, that vast and enraged crowd of snow people are not protesting global warming. They are protesting the prospect of coal mining becoming more expensive, due to carbon taxes. You see, snowmen and snow women cannot see without “two eyes made out of coal,” and carbon taxes could lead to mass blindness, if coal becomes too expensive. It just goes to show you how the law of unintended consequences hits everyone, even snow people. Who would ever dream taxing coal could lead to snow-blindness? Uh-oh, “The cable car is moving again”, after an “unexpected stop” Wednesday, according to executive secretary Ivo De Boer, and is now on its way up to the “summit” of global leaders of the conference. Here’s hoping the little cable car that could, can’t. Wait – is that a wheel I see flying down the hill? History is written by the Victors, it has been said. Let’s hope that Copenhagen 2009 is not remembered for the unusually balmy Nordic December evenings that finally proved just how wrong the contrarian, climate ‘denialists’ really were! I hope that I’m 180 degrees wrong but there’s so much pride, power and politics invested in AGW that guarantees the table is rigged to produce the outcome that was planned! Few people understand the real significance of Climategate, the now-famous hacking of emails from the University of East Anglia Climatic Research Unit (CRU). Most see the contents as demonstrating some arbitrary manipulating of various climate data sources in order to fit preconceived hypotheses (true), or as stonewalling and requesting colleagues to destroy emails to the United Nations Intergovernmental Panel on Climate Change (IPCC) in the face of potential or actual Freedom of Information requests (also true). Monckton shoved by UN police thugs. Knocked unconscious. It’s the Vitamin A, not D. Inuit are/were careful about eating polar bear, seal, and dog livers for that reason. I couldn’t possibly understand just about anything that man was saying, but I am sure he meant “the science is unsettling”. I just found this art; pictures and music by Brian Jorgensen. Global warming in Denmark – Snowstorms causing havoc across the country while the end of United Nations Climate Change Conference COP15 in Copenhagen is drawing near. Video footage and photos from Odense in Denmark December 16th 2009, showing evidence of a lot of snow and “climate change”, or let´s say “global cooling”. The winter came at a very comfortable time and place, like ClimateGate came just in time…. Polar bears don’t eat only penguins. This is for all the delegates. Make sure y’all listen while holding that, um…, niece, yeah that’s what she is, close to you. It is NOT THEIR MONEY so why should they care if they rob the rest of us blind. Thanks to the Money Lenders a USA $50 gold coin is now worth over $1100. That means the current US dollar is now worth $0.045 and the feds ended up with the other $0.95 thanks to the federal Reserve act of 1913, inflation and no gold standard. Oh yes we get to pay state, local and federal taxes out of the $0.045 they left us…. Is that Newcy broon them bears is drinkin’? Since BA every day misdirects up to 4000 peaces of luggage a day (well over a million pieces a year), I would not be surprised at anything (but this time it was not meant to be taken seriously). Anyway, we have kind of Norwegian weather this morning in the London suburbs. BTW thanks for the Christmas tree. Coal and natural gas for the cental plants. Natural gas, garbage, straw for the decentral plants. Rotten ice: Normal natural winter ice that AGW activists believe isn’t there. Rotten snow: Normal natural white snow that AGW activists can’t see. Tynset in Norway today: minus 35,4 degrees Celsius. I haven’t had a television for about 15 years now. There is a way to stop funding the bilge. Piers Corbyn is a jolly good fellow. Yep. December avarage temperature finally dipped to below normal after those hot first two weeks. After ten warm months in a row, with the eighteenth year since 1988 filling warmest 1-18 places of the meteorological record (2009 a number 4 or 5). Reply: I haven’t heard back from you about my proposed bet. I’m quite serious. If you believe in your own statements you stand to make some money. ~ charles the moderator.